We are looking for old snapshots of HH activities. Please submit your pictures WITH all people in the pictures identified, plus a narrative description to Club Historian, Tom Gould. It was during the winter of 1935 that Heiliger Huegel Ski Club was born. An early “big snow” spurred several enthusiastic local skiers to meet at the home of Robert Esser for the purpose of exploring the possibility of skiing in the area. As a result of this first meeting, sixty-five young Milwaukee skiing enthusiasts received an invitation to a meeting at the old Town Club on February 21, 1936. This meeting marked the birth of Heiliger Huegel Ski Club resulting in a charter membership of fifty. Officers presiding that first year were: Fred Pabst, President; Arthur Holbrook, Vice President; Ann Dahlman, Secretary; Elizabeth Hitz, Treasurer; and the Board of Directors: Hermann Nunnemacher, Robert Esser and Paul Stone. It was the love of skiing in those early years that prompted Arthur Holbrook, John Hitz and Edward Purtell to meet with farmer Walter Hembel, the owner of the present hill, to negotiate the first lease. The meeting was held in Hembel’s barn while he was milking and ended with a three year lease for the grand total of $20.00 per year. 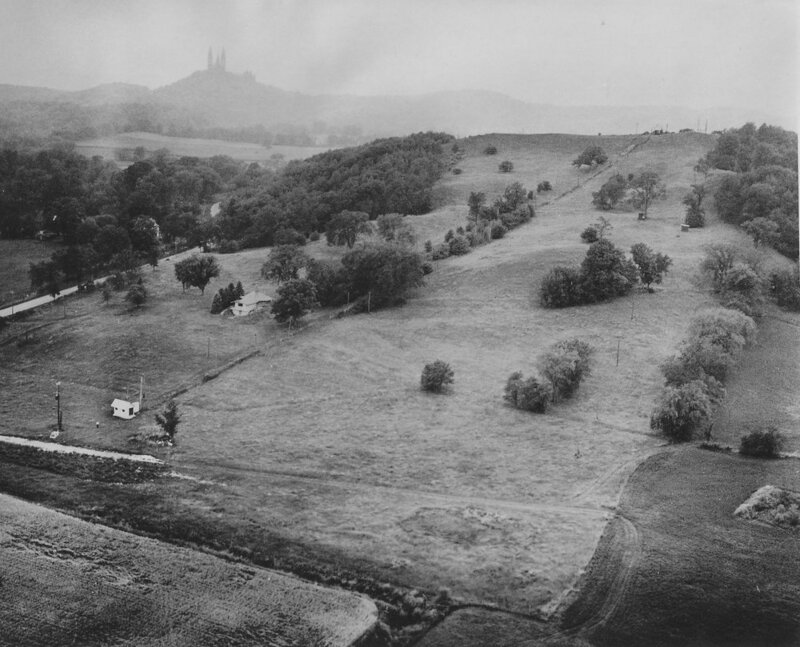 The first lease also allowed members to cut trees, remove rocks and generally improve the hill for skiing. In 1936, skiers would herringbone up the hill in order to ski down. There were no ski tows in the State of Wisconsin at that time. The new ski club was halfway through its first season when a meeting was held at Fred Pabst’s apartment in the Cudahy Tower to choose a name for the club. Even after some drinks and discussion, there wasn’t much inspiration. Calling it “Holy Hill Ski Club” seemed bland and too obvious. Bob Esser asked native German member Paul Goerz Langfeld how “Holy Hill” would translate into German. Langfeld’s reply was “HEILIGER HÜGEL”. It was just that simple, and the name stuck immediately. For ease of typewriter use, the umlaut was removed from “HÜGEL” and the letter ‘e’ was inserted to spell “Heiliger Huegel”. From November 29, 1936, when the original constitution was adopted, the Club has been a leader on the ski scene. 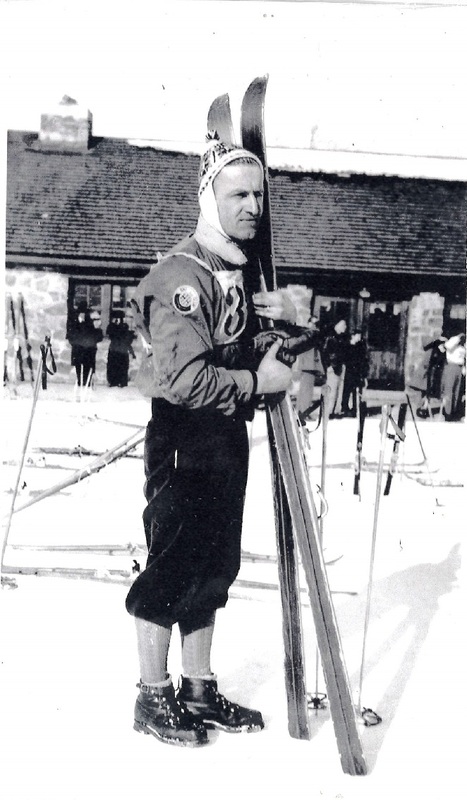 In the fall of 1937, Heiliger Huegel was voted into the Central United States Ski Association. Heiliger Huegel was the first downhill and slalom ski club in the Midwest and the first club to join CUSSA. In 1938, Hermann Nunnemacher installed the first rope tow (second in the State) which was powered by a tractor. Farmer Hembel was paid $10.00 a day for use of his tractor. Heiliger Huegel became incorporated in 1939 and during the World War II years (1941–1945), skiing activities were held at Slinger because of its available passenger rail service, gasoline being rationed. Thirty years later, skiing was revolutionized at Heiliger Huegel with the installation of snowmaking equipment to supplement natural snow. 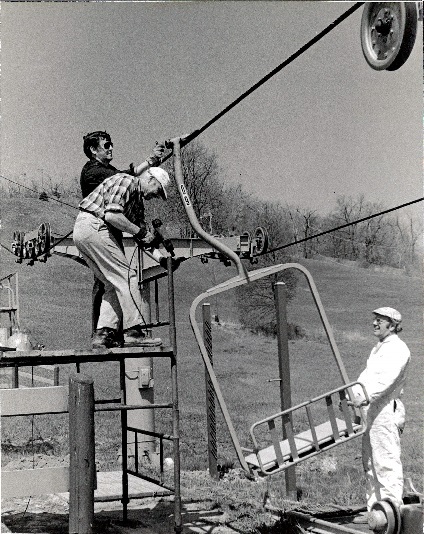 In 1972, another milestone was reached at Heiliger Huegel when the members elected to install a double chair lift, replacing the old rope tow. Today, even those who had preferred other means of uphill transportation are enjoying Heiliger Huegel’s modern lift. The lift increases the skiing area and provided more variety and less crowded conditions. In 1980 an increase in the snowmaking capacity at the hill was achieved in part through the creation of a “cooling pond”, and was completed during the 1982–1983 season with the addition of greatly improved snow guns and better pumping equipment. In 1984 the grooming equipment was updated toinclude a new snow cat and power tiller. The 1984-1985 season also brought about the garage addition for the maintenance and storage of the new grooming equipment. In 1990 a permanent snowmaking station was added northeast of the Chalet. In the same year the Chalet was enlarged and the infamous pit toilets were replaced with “indoor plumbing” and running water. In the late 1990’s there were a number of improvements made including new snow making guns, the addition of “Snowmax”, the expansion of the north slope, the addition of a north snowmaking line, and a new Bombardier snow grooming cat. In 2002 an outdoor fireplace was added west of the chalet and the deck to the south was replaced and expanded. In 2008, after decades of renting from the Hembel Family with the understanding that the Club would buy the property if the Hembels ever wanted to sell, negotiations began in earnest for the Club to purchase the Hill. Just before ski season in November of 2009, the Club closed on the purchase of 80 acres which includes the Hill. The purchase would not have been possible without the seller financing provided by the Hembel Family. The Club is working to retire that debt as quickly as possible. In 2010-11, the Club celebrated its 75th anniversary. Like the 50th anniversary 25 years earlier, the 75th anniversary was commemorated with efforts to gather Club history and memorabilia, press coverage, anniversary souvenirs and Club events including a gala with nearly 300 in attendance. In 2011 the club acquired equipment for grooming trails that can be used for Nordic skiing and snowshoeing. In 2015 we entered into an agreement with neighboring landowners allowing Heiliger Huegel members to use the Schoofs Preserve Trails. We now have approximately 3 miles of groomed trails that our members can use for Nordic skiing and snowshoeing. Also in 2015 the Heiliger Huegel Outdoor Education Foundation was formed. This non-profit 501(c)(3) organization was established to give back to our Communities, and to share our wonderful grounds throughout the year, primarily with youth groups and athletes with disabilities. Boy Scouts, Special Olympic athletes, National Ski Patrol, and local high school racing teams are some of the groups who are currently using the hill and helping us to fulfill the mission of the Foundation. Donations made to the Foundation are tax deductible and will be used to make improvements making our club more accessible and useful to our targeted groups. The Club has an active racing program and each year Heiliger Huegel is well represented at trophy presentations locally, regionally and nationally. Participants range in age from pre-teen through intercollegiate to seniors. It is the many hundreds of hours contributed by members in the spirit of camaraderie and cooperation that has made Heiliger Huegel what is today – a truly unique ski area. That spirit and our hill and facilities are why Heiliger Huegel provides the best skiing environment near any metropolitan area between New York and Colorado.